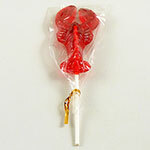 Jumbo Maple Leaf Lollipop. Hand-poured, no preservatives. A taste of the past. Salt free and fat free. Our maple leaf lollipop measures 7 inches tall. The body is about 3 inches wide by 3 inches tall. Ingredients are maple syrup, cane sugar, and tapioca syrup.